I ended up going to Amazon.com and stumbled upon a company called “LotFancy”. I was immediately attracted to the style, selection and who can forget about that beautiful price?! I usually like to pick the oversized style and found just that! The picture below is the pair that I finally decided on.. Did I mention that the glasses come with a holder? Well, they do! These glasses are made out of resin, which is a hard plastic. Let me tell you.. I have two boys, and my youngest steals my pair all the time. These have gone through a lot, and they still look brand new! The glasses have been FDA approved and actually come with a 1 year warranty.. this was definitely another ice breaker for me! The case that you see in the picture above, is not one of those flimsy cases that get destroyed in your purse. This case is made out of a very hard material. My youngest son has dropped this many times, and of course just like the glasses, the case still looks brand new. I can honestly say that I wear these glasses every single day and have not gotten any headaches. I sometimes forget I even have them on, that’s how comfortable and clear they are. I live in Arizona… and let me tell you.. we see enough of the sun, let alone feel it. These glasses have helped me through the hottest part of the summer.. So you might be asking yourself, how much are the glasses? Go ahead and take a guess.. Nope, definitely not in the $30-$100 range.. These glasses are on sale for only… $16.90! If you are looking for some stylin’ glasses that won’t break the bank, I most definitely recommend LotFancy to anyone. They have wonderful customer service and are quite fast with shipping. You can click HERE to be directed to these exact pair of glasses, and from there you can also pick up some for your hubby, because they have an amazing selection of Men’s glasses! Overall, I would say this product is Geeky Mama Approved! *I received a discount on this product in exchange for my honest review. Get ready for school and save 25% on Label Daddy peel and stick custom name labels! Label Daddy is the number one solution for labeling your belongings! No ironing or sewing . . . just peel and stick. Their exclusive laminated coating gives labels an extra layer of protection and is a must for school! Remember to label all clothing, books, bags, sports equipment, electronics, and other personal belongings your kids bring to school, camp, sports leagues, day care, vacation, and other places Label Daddy labels keep them from getting lost or mixed up with others. These convenient labels are great for adults too! — Put them on your sunglass/eyeglass case, phone, camera, sports equipment, tablet, e-reader, hats, clothing, and more. I am always one to be organized and love to have things personalized! After a long look on the webpage, I decided on something my son could use. Trust me, it was a hard decision. since. There are so many items to choose from! The item that I stumbled upon was the personalized zipper tags. For $24.95, I was able to get a 10 pack of 3/4″ circle zipper tags. I figured since my son is now in Kindergarten, these would work great for him. I ended up putting one on each one of his zipper pulls on his backpack and even one on his jacket! He loves them and can’t wait to get more! I was amazed by how easy the process of personalizing these adorable tags was! When it came time to personalize the tags, the site asks for the first and last name you would like on the product. You then choose the label color, font style, font color and icon. I ended up choosing Jake and the Never Land Pirates, because my son is a big fan. Even that was a tough one to choose since there just so many to choose from! From sports teams to Marvel and Disney characters, there is just an amazing selection. One tip I do suggest with these zipper tags is to not pull really hard on them. They can handle a lot, but if my son pulls to hard on them, the clip can break. The bag that the tags came in does have a warning label stating that these are not actual pulls, but are tags that label your garments. I personally use them in other ways and we love them. I definitely recommend giving this company a try! It’s easy to purchase on their website, fast delivery, and outstanding products. Who could ask for more? If you have a child at home that has a hard time going to sleep, I have found the solution to all your problems! I stumbled upon a true miracle called, Fade Away Sleep Sounds. Fade Away Sleep Sounds is a company that offers you a variety of sounds to help you put even your fussiest baby to sleep! They don’t just help children but they can help you as well! So what’s their secret? Two words.. “white noise”. You may be asking yourself what white noise is. Let me explain by letting you read some of the scientific benefits of white noise from wisegeek.com.. I personally have a problem with sleeping because I actually can’t stand silence. May seem strange, I know. The only way that I am able to sleep is by having my fan on, or by the gentle sounds of the rain falling outside my window. Since I had used these downloaded sound clips for my boys, I thought I would go ahead and give it a try. Since I already had my fan on, I decided to try the “Thunderstorm Sounds”. Immediately I felt a sense of relaxation. If you are a Mom, you know how hard it is to turn off those thoughts in your head. Your always constantly thinking about errands, projects, etc. The sound was able to drown all of that out, and for the first time, I was able to sleep like a baby! Also, I suffer from anxiety and at times I can have anxiety attacks in my sleep. Since I have been listening to “Thunderstorm Sounds”, “Shower Sounds” and “Rushing River”, I have not suffered from one anxiety attack in the middle of the night. My kids love it! At first, I had to test all the sounds out on them, to figure out which would be the best fit for them. They already sleep with a fan on as well and I knew that they were both scared of storms, I decided to try out the “Rushing River”. If you have a child that suffers from really bad night terrors, I truly believe that this helps. My oldest son wakes up a lot, screaming and lashing out. Since he has been listening to this, he hasn’t had any episodes. Since starting Kindergarten 3 weeks ago, he needs to get a good nights sleep, and these help him with this as well. Let me just add a little note saying that customer service is huge deal to me. Kevin is one of the owners to this company, and let me just say he is one of the kindest people you will ever talk to. He is there to always answer any questions you may have! If you would like to know more about Fade Away Sleep Sounds, please click here! On their website, you will be able to get pricing, information on streaming their sounds, bundling sounds, and more! All in all, I can say, this product is extremely beneficial for your children and for yourself! So now instead of staying up all night, trying to put your baby to sleep.. You can now say..
My son, Adam, after listening to Fade Away Sleep Sounds. Having a husband that works from 2 AM- 3PM everyday, one major issue that is always on my mind, is safety for my children and for myself. Will someone break in? What about during the day when we are running errands? My family does not own a firearm, for personal reasons, but I did come across a product that I would feel safe enough to have in my home. The TASER Pulse is an amazing self defense tool that I was lucky enough to be able to test out for a couple weeks! At first the Taser may seem a little intimidating, but honestly, after about 15 minutes of reading about all the features and scanning it over, your doubts will disappear. The Taser itself has a safety switch that you can see in the picture (above). When lever is down, it is turned off and will not operate unless the switch is pushed up. You will most definitely be able to tell when the device is not on safety. The light will shine, a laser pointer displays for the target and a little light that shows the level of the batteries will shine, as seen in the picture (below). The device even comes with a free holster and replaceable cartridge. The holster easily fits over the Taser and I was able to slip it into my purse with no problem. I kept the TASER Pulse in my purse for a week (picture below) and I will say with all honesty, I felt safe. Let me get to the technical information about this amazingly beneficial product! When shooting the TASER Pulse, it is best to be done within 15 feet of your target. When the target is shot with this device, it affects the sensory and motor functions of the peripheral nervous system to immobilize the body. The Taser has a light (pictured above) that tells you what life the batteries have left. If red, the batteries are dying and need to be replaced and when green, it is good to go! The battery even has a 2 year life! The battery has enough power for 50, 30 second firings. This is all depending on the temperature, environment and other factors as well. What I found to be extremely interesting, is that when the device is deployed, there are 20-30 small confetti like AFID tags that are ejected. Each of those tags are printed with the serial number of the Taser gun to help with law enforcement. Before transporting this device, you do need to make sure you know your states laws on transporting! I can not stress this enough! I had no problem carrying it here in Arizona, so I did carry it in my purse for a whole week. It was very lightweight and small so I had no issues storing it. Being a woman, we need to make sure we know that to do in case something ever does happen. For instance, my husband is not always physically there to keep us safe, so my children then turn to me to do so. I am a smaller built woman and would have a tough time defending myself, but I truly believe that the TASER Pulse helped me to believe that I was strong and could handle anything that came our way! Always make sure you have a plan of action when alone, even if your at home. I strongly believe that this product is beneficial, so much so, that I will be purchasing one for my home. This product is Geeky Mama Approved! If you would like more information on this product, such as pricing, statistics, safety information.. etc. Please click here! *I was able to sample this product for free in exchange for my honest review. If you have a little one at home that is potty training or is scared of the dark, this product will be so beneficial to you! I came across a product that allows you to hook up a night light to your toilet! The product was introduced on Shark Tank and is called, Illumibowl, The Motion Activated Toilet Nighlight. My oldest son is very scared of the dark and I thought trying this product out would be so worth it if I could get him to use the restroom at night. He actually has a history of accidents in his bed because he is too scared to wake up in the middle of the night! Trust me, I have tried it all, with no success, until I came across the Illumibowl! Both my boys are in the process of learning all their colors. When they saw that the toilet had a light that could rotate 9 different colors, they couldn’t help themselves. They had to check it out… for a good hour! I live in a household of all boys, my hubby and my 2 sons.. Needless to say this product has helped me in the long run when it comes to cleaning up messes! I love how easy the product is to connect on the toilet. Of course, like many products out there, it will require batteries, 3 AAA’s to be exact…All you have to do is wet the suction cups on the small box and the light that is connected. Suction the cups from the small box to the outer rim of the toilet. (Tip: It’s best to have the device on the side of the bathroom door.) Hang the small light into the toilet on the inner rim. (See picture above) You will notice that when you put batteries in, nothing happens. This is because the light only activates in the dark! Now, I had a tough time at first with the suction cups sticking, but after making sure the toilet’s rim was completely clean, and running the suction cups under warm water, it began to stick perfectly! The fact that the product is motion activated is a big plus for me. I love saving energy of any kind, even if its using a battery! Motion activated = You save $$ on buying batteries! Now, I don’t personally like taking pictures of my toilet.. but showing you how great this light looks, was something I had to do! You can pick up the Illumibowl at your local Bed Bath & Beyond, or if you prefer to shop online, you can purchase through Amazon, for less than $15! Check out: Illumibowl.com for FAQ’s and more information! Overall, this product is Geeky Mama approved! Todays generation of kids will work more with technology than ever before! Might as well get them practicing now right? I found a very educational company that has children learning and having fun! To make this even better, this is a monthly subscription box, which nowadays everyone can’t get enough of! Why not love a mystery box delivered to your front door once a month? The box that I am reviewing is called “Bitsbox”. When I received the box, I found a catalog full of codes. Looking through the pages I learned that this company lets children learn how to make their own apps through coding! Each page has a game that the child can play on the Bitsbox website. The only way to play it is to create the game yourself! In the picture below, there is a code in the white box. This code is what the child inputs into the website and up comes the game…. but only if the coding is typed in correctly! There were endless amounts of games that my 4 year old had so much fun with, and still is. He is constantly asking me if he can “make his games”. This box is meant for children ages 6-12. My son is only 4 and had a blast with it. He did have a tough time with typing on the keyboard, but that is something he will learn throughout the years. The Bitsbox website is free to use to input the codes for the child to play on. The physical box costs $40 per month if you pay month-to-month, or $30 per month if you prepay for a year. There is also a PDF version for $20! For the laughter and the smiles (as you can see in the above picture!) this box is definitely worth the price and not only that, they are learning how to code! Bitsbox, you are definitely a keeper! Check out www.bitsbox.com! *I received these samples for free in exchange for my honest review. A month ago, my hubby and I decided to start eating right and start juicing. (Best decision we have ever made!) Before we could even start getting healthy, we needed to buy a juicer. I had purchased a small one thinking that it was convenient and hey.. it was cheap. Well, little did I know it would break one week after purchase! I ended up researching online, looking for the best juicer at the right price. That’s when I came across the Hamilton Beach Big Mouth Pro Juicer Extractor! I found the juicer at Walmart for $59.99 and decided to give it a try since it had so many great reviews! The juicer came with a brush to clean the micro-mesh strain basket. (This is what separates the juice from the pulp.) Many of the cheaper juicers do not come with a brush and in my opinion, this is a very important item. It also comes with a 20oz juicing cup, which is perfect size to fill a cup or Blender Bottle. A couple tips I will give is: 1) Stick a grocery bag into the receptacle (the container that the pulp falls into) so that when it is time for clean up, you can take the bag out, tie it up and throw it away. No need to wash. Voila! 2) DO NOT USE A SCOURING PAD TO CLEAN THIS JUICER! You use the scouring pad and it will have really bad scratches all over. (It’s not pretty… believe me!) You can just use a wash cloth with some soap and water to clean it up. One of the best things about this juicer is that it has a large spout to put your fruits and vegetables in. I was able to put whole apples, oranges (without the peel), cucumbers, carrots… etc. This made it so much easier and FASTER! This juicer is definitely one small household appliance I am NOT letting go of! For a long time I kept hearing about Scentsy, but always had the impression they were too expensive. Until one day my Mom had a friend that was a Scentsy Consultant. This was around Christmas time and my Mom gave me the opportunity to pick a warmer and some scented wax bars. I browsed through the catalog and stumbled upon the Scentsy Doodlebud warmer. This was the perfect style for me! Then I had to make another tough decision… What scent did I want the wax bars to be? I ended up choosing Skinny Dippin’ because I am a fan of fruity smells… And c’mon you gotta love those names! When I received the two as a gift… I don’t think there has been a day that I haven’t had it on! The smell is so amazing that it is almost indescribable. The mixture of the fresh green apples, melons and pears is the perfect blend and most definitely recommend this scent if your fruity smell type of person. It seems while going through the catalog, I noticed there is a style to match anyone’s personality! The warmers are actually pretty reasonable in price. They range from $20-$40. There is so many different styles and colors to choose from as well. In my opinion the prices for the Scentsy wax bars are incredible! The scent that I had gotten was only a whoppin’ $5! One bar = 80 hours of heavenly greatness! There really is no limit to how long you have your warmer on for. Just think of it as if were a nightlight. Just a caution: Do make sure to keep this out of reach of children! The warmer does get hot and the wax is not something you would want to touch when melted. 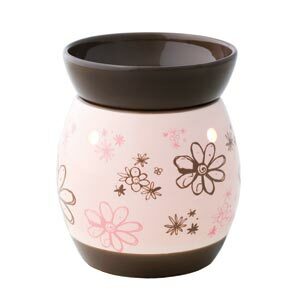 If you are looking to purchase a fragrance wax warmer, I would definitely recommend checking out Scentsy! Just check out Scentsy.com, and from there you can enter your zip code to find a consultant near you!